Bottom Rubber Panama DMS outsole to exact spec used in 1967. Molded on original press equipment. Upper Black Full-grain leather and heavy weight olive drab cotton duck as used in original boot. Closure System Nylon coated speedhook & eyelet lace system. Ventilation Nylon coated brass drainage vents in inside arch for rapid drying in wet conditions. Description Back by popular demand, this is an authentic version of the original Jungle Boot as used during the Vietnam era. We still make it with the vulcanized DMS Panama outsole on the original equipment McRae used when the boot was a contract/mil-spec item. These boots, (also in alternate color combinations) remain popular due to their great durability, comfort, value. Great boot. Makes an old soldier feel young again. May even help to keep Kiwi in business. I hope that you keep making this great icon. 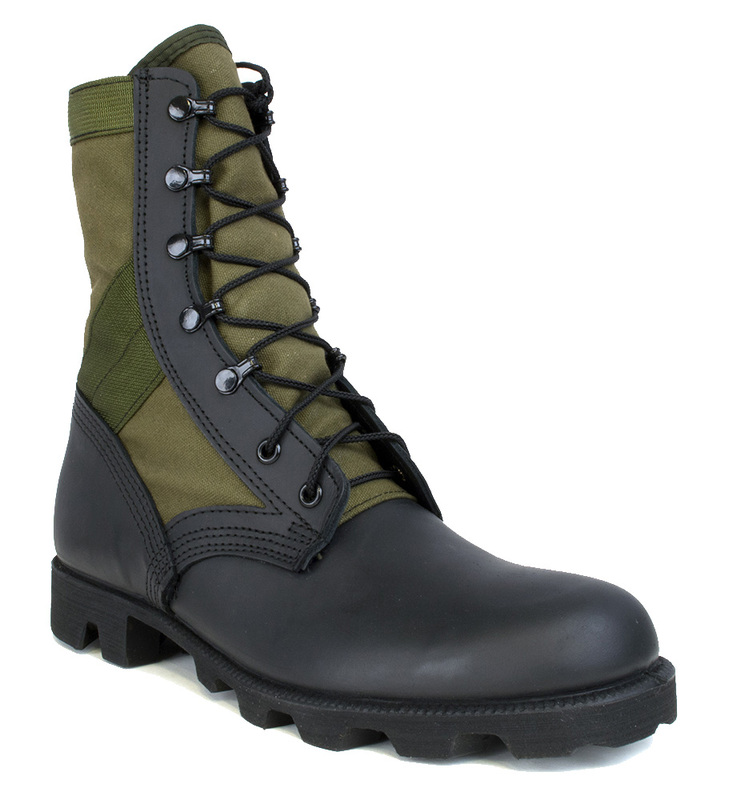 Got my Jungle boots and love them same size as the Cordura Green McRae Jungles used to make. Hope you go back to the Green Cordura as I feel it last longer and don't fade. Wish there and was a updated one with the softer dual pattern Vibrams . Save wherever you can, but NEVER EVER save on your footwear! These boots are the real deal, durable and the most comfortable I ever had. They are perfect for long walks or marches and will keep your feet protected and dry even in hot weather. 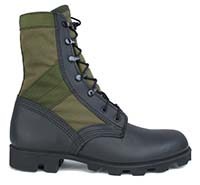 <br /> <br /> In the Vietnam era, most of these boots had a steel shank for spike protection. According to a flyer that comes with the boots, McRae is also producing the steel sole version again by special order. So if that's something you need, give them a call! I bought these boots for building portage trails up in Quetico Provincial park and the Minnesota parks where our feet were wet nearly constantly and they held up incredibly well from sharp rocky landings to portaging through chest deep moose muck. they were just as comfortable wet as they are dry and I am the only guy on the crew who's boots were not falling apart by the end. I still wear them for hiking and they are like slippers, I've never worn a more comfortable and durable boot. Thank you McRae Footwear for bringing back this boot. Got my first pair from Uncle Sam back in 1968. This is the real deal in a Jungle Boot. Light weight and good support. This Old Man has Happy Feet again. Great boot; it's the real deal! I feel so lucky that McRae reintroduced this boot. 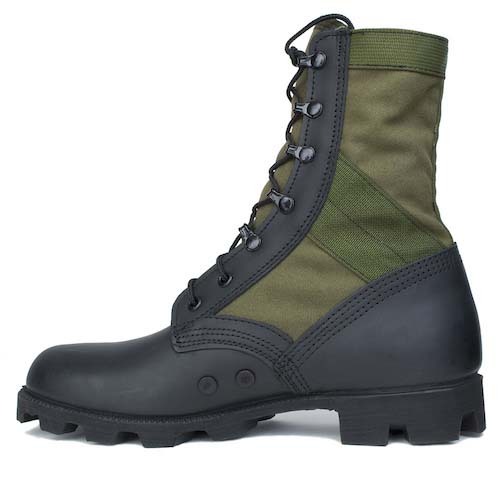 The Army's current issued hot weather boot is horrible for wearing wet and walking long distances. These reintroduced 1967 jungle boots wear just like the originals -- they are perfect for wearing in water and walking long distances. They are also great for warm dry environments. 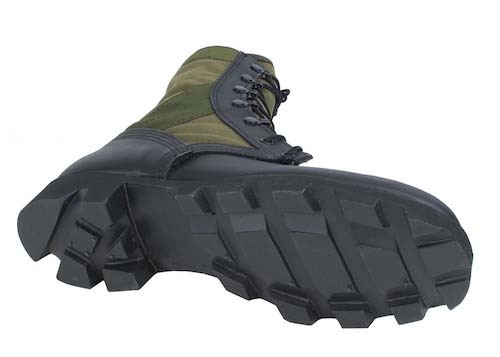 There is no other footwear that provides the protection and comfort of these boots. Thank you McRae -- I needed these boots; you have made me and my feet happy. I am a healthy, physically fit, and active 65 year old Army veteran. I wore boots nearly identical to these in the Army Infantry back in the 1980's. Still the most comfortable boots I've ever worn. Once broken in they feel like slippers and they are light and airy. The only difference in these is the addition of speed laces (a good thing) and the newer footbed (also a good thing). I just ordered a pair of the all leather combat boots that are similar to these and I'll probably order some more jungles before they stop making them! Great boots! Excellent quality! Excellent durability! Wear mine at work. Bulk fuels tank truck driver. Excellent grip on the soles and the panama sole sheds mud with ease. Lightweight and very comfortable. Made in USA! Customer service at McRae Footwear is excellent. 100% satisfied and proud to wear my McRae Jungle Boots! Thanks McRae! I ordered my jungle boots and got them within 2 days, all I have to say is these boots are the best I have ever worn!! Love them!! !